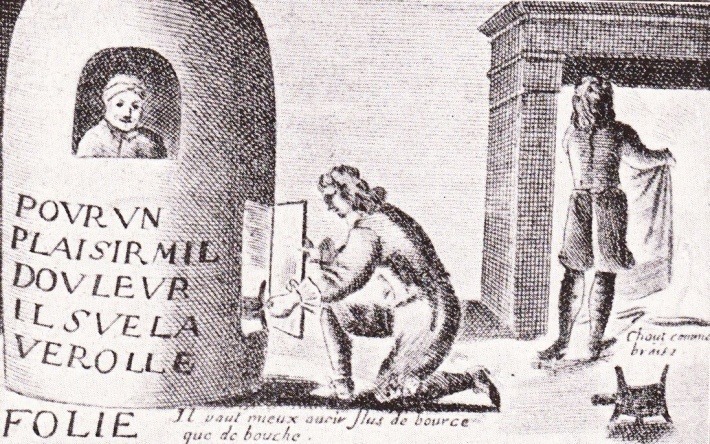 Engraving showing a man in a fumigation stove (1659), Jacques Laniet. A common treatment for syphilis at the time. Mercury would be placed inside the stove, and a fire would be started to vaporise the mercury around the patient. Yes, this is true! This is a subject that really reflects how useful art history can be in studying the history of science and medicine, and how art has been used to educate people about medical conditions for hundreds of years. Beyond that, however, we can also use art to see how societal views of STDs have evolved – from simply fearful to judgmental and sexualised. You’re right, by the way: syphilis is the STD that’s most commonly represented throughout art history, so it’s the one we’re going to focus on (with one brief depiction of gonorrhoea). Syphilis is one of the only STDs that have been around for a really long time (along with, again, gonorrhoea), so it is a disease that has been widely depicted in art history.